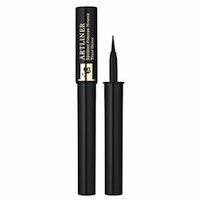 This is a really good eyeliner. The point is really thin so you can make thin or thick lines. Holding power is amazing as well. It doesn't just 'disappear' after I go out for the day. It is easy to use, glides on smooth. Dries fast, it comes in wonderful colors. Doesn't last all day you will have to carry in your purse to touch up especially if you touch your eyes a lot.